where the spacing between velocity bins (delta_v_Doppler) is stored by the radial file variable spectral_velocity_bin_spacing. Note that spectra are cyclic about the Nyquist velocity, i.e. about velocity bin (-N_DFT/2). 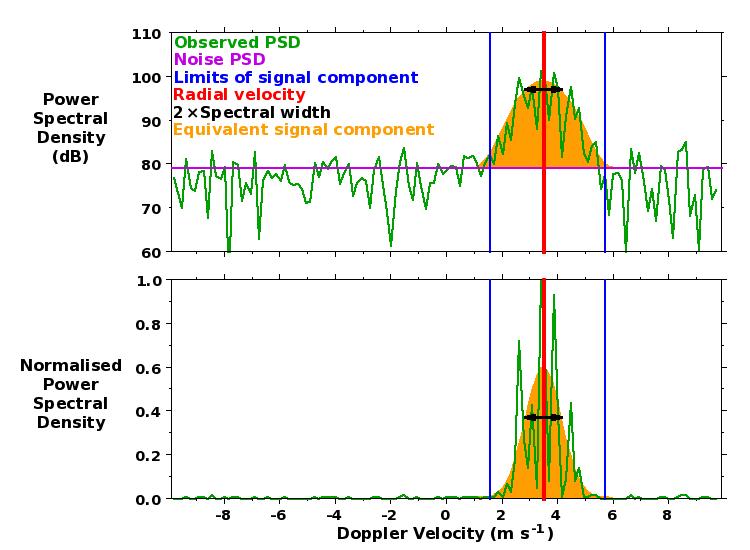 Observed spectra typically consist of a single (quasi-Gaussian) radar return signal component (although there are sometimes additional signal components) superimposed on a background of white noise. The latter implies quasi-constant PSD values at all velocity bins. 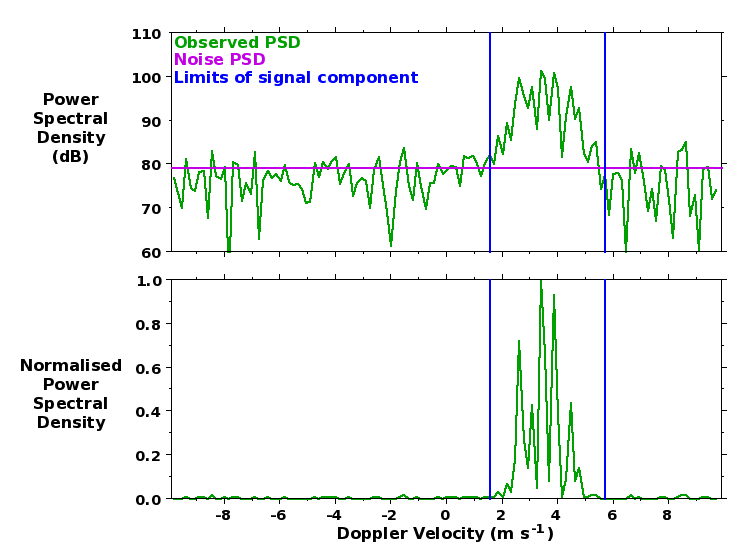 DC biases in the raw radar samples lead to contamination of the PSD for the zero-Doppler-velocity velocity bin, i.e. at b = 0. This must be removed from the recorded spectra before processing can begin. If a Hanning rather than a Rectangular window is used in deriving the spectra (this choice is recorded by the spectral and radial file variable data_weighting_window_index), the contamination is additionally spread to the velocity bins to either side, i.e. it affects velocity bins from (b = -1) to (b = +1). The contamination is typically removed by replacing the PSDs with values linearly interpolated between those at the velocity bins to either side of affected region. The dc contamination has been removed from the spectrum shown above. For spectra derived using a Rectangular window, leakage from strong signal components can affect all velocity bins - see e.g. Hooper (1999). This leads to an overestimate of the noise level, which is otherwise expected to be constant at all range gates. A better estimate of noise level can therefore be obtained by taking the median value over all range gates. The noise power is dominated by broad-band lower-VHF galactic radiation, which undergoes a distinct quasi-diurnal variation of almost 4 dB amplitude. the value drops below 0.01 of the peak smoothed PSD value, if this is reached before dropping below the noise PSD. This condition is particularly important where use of a Rectangular window has led to spectral leakage. It prevents low PSD values at the edges of signal components from having a disproportionately large effect on the spectral width values. Such low values would have a negligible contribution to the total signal power power - see e.g. Hooper (1999). it encounters a local minimum for which the smoothed PSD value is less than 0.1 of the peak smoothed PSD value. This condition is important for resolving partially-overlapping clear-air (i.e. desirable) and unwanted signal components. These (inclusive) limits - recorded by the radial file variables first_velocity_bin_number and final_velocity_bin_number, but abbreviated here as b1 and b2 - are shown by the blue lines in the figure above. During the process of signal identification, the observed spectrum is first extended with a copy of itself being wrapped around the Nyquist velocity bin to either side, i.e. (b = -N_DFT/2) and (b = +N_DFT/2). A partially velocity-aliased signal component, i.e. one which is apparent at both Doppler velocity bin extremes of the original spectrum, is indicated in the radial files by having ones of its velocity bin limits being extended beyond the expected range of (-N_DFT/2) to (N_DFT/2 - 1). They are stored by the radial file variables signal_power, radial_velocity, and spectral_width, respectively. These can be used to define the magnitude, the central location and the standard deviation, respectively, of an equivalent Gaussian signal component - shown by the orange feature in the figure below - which give rise to the same values of the three lowest-order moments. P. K. Rastogi, A note on the use of coherent integration in periodogram analysis of MST radar signals, Handbook for MAP, 9, edited by B. Edwards, Sci. Comm. on Sol.-Terr. Phys. Secr., Boulder, Colorado, pp 509-512, 1983.